An early classic thematic board game. A classic, and possibly the first ‘semi-cooperative’ game. 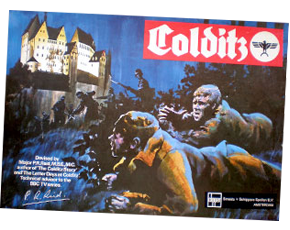 My 1973 Parker Brothers edition has some wonderfully designed faux-WWII documents and a booklet with historical information on the infamous German POW castle of Colditz and the eponymous escapes. Designer(s): Bob Brechin, Brian Degas, Major P.R. Reid M.B.E., M.C.